I’ve decided to try something new! As many of you know, I’m putting together a book on how to write a murder mystery (see: How to Write a Murderously Good Mystery: The Major Characters). As part of that I’ve begun developing an example story, a traditional murder mystery with elements of a cozy. I don't plan on using this outline to write a story—but if you would like to, please do! Please keep in mind that this is an experiment! I don’t have the story already plotted. I will be putting it together as I go (and please feel free to make suggestions!). As a result the outline will evolve. Story elements will shift, break apart, re-form and (occasionally) disappear. At the end of it all I should have a completed outline for a traditional murder mystery. At that point I’ll bundle up all the posts as well as the example story outline and put it into a book for easier access. I’d love to know what you think of this idea! Thumbs up, thumbs down? You can leave a comment here or contact me privately. Thanks! So, here we go! What follows is the theory and then, tomorrow, I’ll post my outline of the murderer, one which implements most of these points. The murderer is the person who violates the norms of society by intentionally ending the life of another. Since the sleuth can only be as formidable as the antagonist (weak antagonist equals weak sleuth), make the antagonist smart and capable. How are you going to show the murderer is smart and capable? What sort of actions would demonstrate this? What are the murderer’s most important characteristics, their tags and traits? 2. Differentiate the murderer’s motivation from his/her goal. Picture this: A man in a rowboat frantically rows away from a shark and heads toward an island. Character’s motivation: To escape the shark. Character’s goal: To reach the island. Story Question: Will the man reach the island before the shark eats him? The character’s motivation explains the goal and reveals their passion. How does the murderer’s motivation resolve into a concrete goal? How does the murderer’s motivation show their passion? 3. What is the murderer’s goal? The murderer must either passionately want to acquire something or prevent the loss of something (spouse, job, status, money, power, and so on). 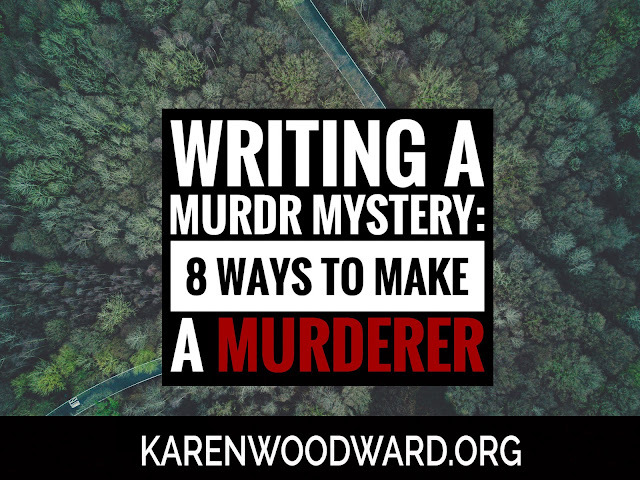 The murderer’s general goal is to get away with his/her crime, but let’s drill down. What, SPECIFICALLY, does the murderer want? Does she want to prevent the loss of her business? Acquire satisfaction by getting revenge on the sister/mother/brother/father who made her life hell for the last 30 or so years? Prevent the loss of her spouse by preventing him from running off with his much younger mistress? Prevent her sibling from gaining the inheritance? I love Agatha Christie’s work but occasionally she wrote killers who were motivated solely by money. For instance, in Evil Under the Sun the murderer's specific motivations aren’t revealed other than that they killed to acquire the victim’s vast fortune. It would have been nice to know WHY the murderers were so intent on acquiring vast sums of money. Sure, who doesn’t want vast sums of money? But still. It doesn’t personalize the killers in any way. If they had needed the money to finance an operation for their child, or because one of them wanted to return home to Russia one last time to see her ailing mother, or ... well, you get the idea. What does the murderer love? Be specific. Why is the murderer passionate about attaining this particular goal? 4. Be merciless! Give the murderer a deep psychological wound. The murderer, like the sleuth, should have a deep psychological wound. The wound needn’t explain the murder or in any way justify it, but it WILL help humanize them. Moriarty’s strength was also his weakness (as Mr. Monk said, “It’s a gift and a curse.”) He is brilliant but his very brilliance isolates him. This is true for Sherlock as well, but he has been able to make connections to others, to Dr. John Watson, Mrs. Hudson, DI Lestrade and Molly Hooper. Moriarty views regular humans (in other words, you and me) as ants to be squashed if it suits him. What is your murderer’s deep psychological wound? How is this deep psychological wound tied into Lydia's strength? 5. Let the murderer win occasionally. Keep in mind that letting the murderer score a point on the detective is different from the detective suffering a setback. If a grumpy witness refuses to cooperate that is a setback for the detective (and so, automatically, a gain for the antagonist) but here I’m talking about a stratagem—an intentional plan implemented by the murderer that paid off. Perhaps the murderer feels the detective is getting too close and he/she plants a red herring that succeeds (at least for a while) in misdirecting the detective. 6. How does the murderer attempt to mislead the detective? At a certain point all the clues will be on the table. The detective just isn’t seeing them in the right way. This will soon change. The murderer needs to at least TRY to spin the events. They need to have some sort of story that explains the murders, the clues gathered, but in a way that casts them as an innocent person. I think of this as the Janus Story, after the two headed god. The murderer is in the unique position of, throughout the entire story, knowing the truth but they must spin a convincing lie. What is your murderer's Janus story? 7. Reveal the killer’s true face. The murderer is a cold-blooded killer. She has taken the lives of those she knew, perhaps even those she loved. AND she did it for personal gain. She’s NOT nice, NOT ordinary, perhaps not even sane (though she will likely APPEAR to be all these things prior to being revealed). At the reveal it is important we get to see the murderer as she really is. We need to see the murderer’s contempt for those around her, for those who counted themselves her friends (a terrific example of this is Agatha Christie’s Peril at End House). At the end of the story how does the murderer reveal his/her inner nature? What do they say? What do they do? What does the killer fear the most? How does the murderer react to being unmasked? Does she become violent? Does she curse the detective? Does she try to make everyone understand why she did it, why she had to do it? 8. What happens to the killer at the end? If you're writing a traditional murder mystery, then there has to be some sort of punishment meted out. SOMEONE must be punished. But if you want to have a recurring character you could make one person the 'sufferer,' they get caught and pay the price, but their partner—or perhaps the mastermind—escapes. Still, though, at some point they must pay. So, even if they aren't punished in the current story, think about what their ultimate fate will be. How will you wrap up the killer's story? Do they go to jail? Are they killed? Do they (as Agatha Christie wrote in several of her books) take their own lives? Today I’m recommending Jeff VanderMeer’s wonderful creation: Wonderbook: The Illustrated Guide to Creating Imaginative Fiction. That’s it! As I said, tomorrow I’ll post the start of my outline. Please keep in mind this is an experiment and that your feedback is (as always!) welcome. hello, very interesting post, it's certainly going to help me with figuring my mystery novel out. (still in the research phase.) love the questions under every explanation.